The new Netflix documentary Chasing Coral is lush with waving coral in teal, mustard, and magenta. But many viewers might be surprised to learn that Australia’s Coral Sea houses an estimated 600 species of hard and soft coral, supporting about 1,500 species of fish and marine life ranging from jellyfish to dolphins. As the documentary makes clear, though, the reef is seriously imperiled. Back in 2012, a study in the Proceedings of the National Academy of Sciences showed that since 1985, coral population had halved. That worrisome rate has only accelerated in the last five years, as bleaching events in late 2016 turned 93 percent of the reef into a chalky white, resulting in an only-slightly-dramatic obituary for the reef in the magazine Outside. But what exactly is coral — and what do we have to lose? On the left, a map of the Great Barrier Reef in context of the Australian continent. On the right, a satellite image of part of the Great Barrier Reef as seen from space. First, there’s a stark difference between hard and soft coral. Hard coral are the building blocks of reefs. A collection of thousands of tiny polyps that secrete limestone, they form a shared skeleton that supports other life. 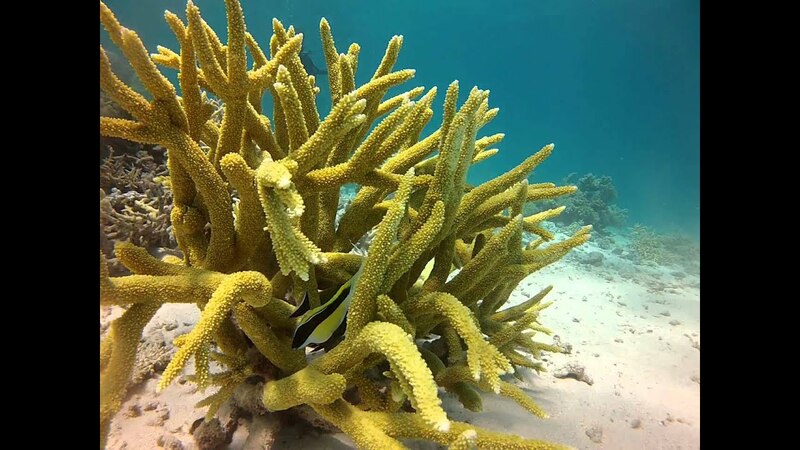 For 25 million years, the National Ocean and Atmospheric Association says, these reefs have relied on symbiotic relationships with other marine life, providing shelter in exchange for neighbors that clean up its waste and the chance to grab nutrients that flow by in ocean currents. Within each of these subsets of coral are thousands of unique species. Like all animals, they come with scientific name and a more commonly used colloquial name based on its appearance. Take, for example, Acropora cervicornis, also known as the staghorn coral for it’s antler-like appearance. One of the most common types of coral, it’s found all across the Earth’s tropical zone, from the Great Barrier Reef to the Caribbean. A staghorn coral harboring fish. A brain coral deep in thought. But many of these species could be pushed to the brink by global climate change. To combat the slow and painful death of the Great Barrier Reef, scientists are working on conservation efforts and activists are fighting for restrictions on greenhouse gas emissions. Others, like Chasing Coral director Jeff Orlowski, are focused simply on documenting the reef. That way, if it really does become a spooky underwater graveyard, future generations will at least know what we’ve lost. And it’s clear there is a lot to lose. Media via Wikipedia, YouTube, Giphy, Flickr / Kyle Taylor, Dream It. Do It.